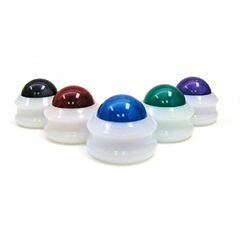 The perfect size for tucking away in your purse or pocket, the Omni Mini Roller freatures a smaller version of the "omni-directional" ball with the same unique mobility and ease of use. Knots and restrictions can be felt in the tissue--similar to driving a car over a speed bump--the Omni Mini Roller allows you to feel what is going on in the body. The Omni Mini Roller diffuses the intensity of direct pressure. Never use over boney structures, such as directly on the spinal column. With long-lasting and durable construction, all Omni Massage products can be used in the whirlpool or a soothing bathtub, as there are no internal parts to wear out or corrode. Available in black, red, blue, green, and purple. White cap only. They were shipped quick. Sturdy product. exactly as advertised. I use this massager after every haircut. It was only after requests that I carry and sell it that I bought extra to sell. Now it is my hottest seller. people love the low price and quality product.